Ran across Zentangle through a friend and decided to give it a shot. Needing some direction, I tried I am the Diva's most weekly challenge: #215 Labyrinth. I drew the labyrinth in as a string and then allowed it to fade to the background as I filled in the spaces around it, picking new tangles each layer out from the center. My labyrinth was a bit off center, so follow the river path to it. I'm still very new at this, so there's no shading, and I haven't quite worked out a line density that I like yet. But overall, I love the result of this. Tangles used: Kuke, Flux, Tri-Po, Half Onion, 'Nzeppel, River, Tipple, Fescu, and Hepmee. I think this week's challenge is quite the challenge! *haha* I haven't tried anything yet but I'm planning to. Your patterns look great but I'm missing the shading a little bit. The picture is a bit bigger than the actual image (which is 3.25"), I was a bit intimidated by shading such small shapes. I'll get there eventually. And, thanks, they are pretty dogs! This is great! I have been super inspired by Zentangles I see but haven't really given it a shot. Your outcome is glorious! What kind of pen are you using? The actual, physical image is only 3.25", so the lines in person are much thinner. I'm just using a Uniball Vision Needle .5 mm Roller Ball pen that I picked up in the supermarket. Paper is an old sketch book. 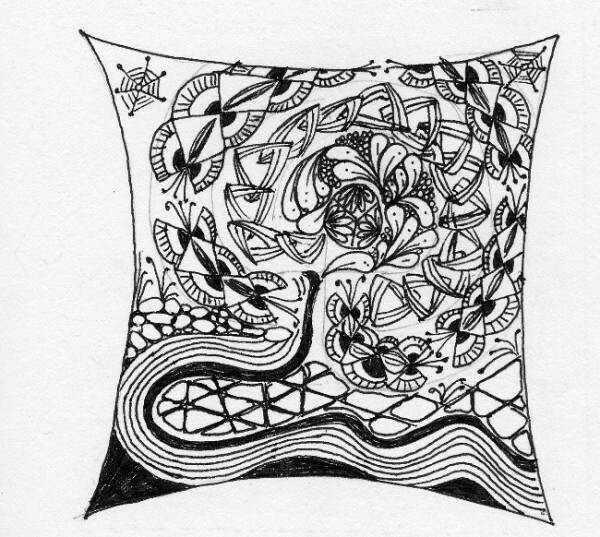 I never heard of this Zentangle thing but it looks like something I would enjoy! I like yours! I think it would be right up your alley. Quite fun and relaxing. I had the same problem. Getting one drawn properly and getting it centered on the space was more than I could figure. I settled for getting it drawn halfway properly.